Basil's Blog: I do not like it here or there. I do not like Obamacare. I do not like it here or there. I do not like Obamacare. Ted Cruz was doing the whole filibuster thing about Obamacare or something. A lot of pundits were saying it was doomed to failure, but they're pundits. Pundits don't know jack. Unless Frank J. is a pundit. Then forget what I just said. I think the filibuster is great. First, there's the whole reading Dr. Seuss thing. And Dr. Seuss has written more smarter, insightfuller things than most Senators have ever written. So, it ups the level of the Senate. It also lets you see who else is willing to go along and try to ... well, do whatever he's doing; stop Obamacare, I think. But, I wondered what else should Senator Cruz, or anyone trying to filibuster this, read aloud on the Senate floor. I thought actually reading the Obamacare law would be a good idea. But, I don't know if one man could do all that. What do you think would something good to read to help stop Obamacare (or whatever it is Cruz is doing)? "Oh, The Things You'll Sequester!" How about the Federalist Papers? right now he is reading bios of the signers of the Declaration of Independence. OT, but I thought you might like this. I didn't realize how old that article was. 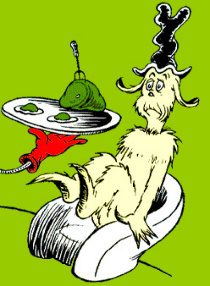 In keeping with the Dr. Seuss theme, "What Was I Scared Of?" "Where the wild things are", a brief history of liberals in Californiaaaa. Frank J. is a pundit? I thought he was a journalist now. "Watch money. Money is the barometer of a society’s virtue. When you see that trading is done, not by consent, but by compulsion–when you see that in order to produce, you need to obtain permission from men who produce nothing–when you see that money is flowing to those who deal, not in goods, but in favors–when you see that men get richer by graft and by pull than by work, and your laws don’t protect you against them, but protect them against you–when you see corruption being rewarded and honesty becoming a self-sacrifice–you may know that your society is doomed." Yep. I reckon we're Doomed.